I promised an unforgettable opener to the Experience and I don’t think the team disappointed. The 9:45 crowd was about to explode our of their seats…the energy was incredible. If you missed it, you definitely missed something special. One of our core values is that…”Excellence honors God and inspires people”. Even the midst of the band covering 70’s music, I couldn’t help but get a little choked up as I saw the team giving their all to God in the hopes that something like that would prepare hearts for what was yet to come. The band worked incredibly hard and the video plus medley was the perfect start to the series. Great job by Brian in coming up with the arrangement and I thought Andrea knocked her parts out of the park. Brian and the stage team did an awesome job creating a new set…definitely one of my favorites. I think the new times periods worked out great. 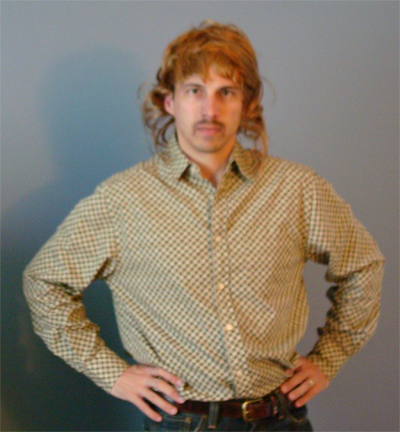 I felt so goofy in my 70’s garb and wig, but I was pleased that the fu-manchu grew in. Gayle as well did a great job in covering “Imagine”…such a beautiful song, too bad as we saw in the message that the lyrics are so unrealistic. Thankfully though Jesus has a better way…”Love your enemies and pray for those the persecute you”. I’m also still amazed at how seriously Jesus takes the whole forgiveness thing…in essence…if you don’t forgive others, God will not forgive you. The energy at 11:15 was completely different…however still a good day! Right before the first Experience I was in my office and the phone rang. I answered and it was a man (not from the church) asking if he could meet with me ASAP. I told him I could meet at 12:30 and he said that was fine. When I met with him you could tell he was broken and struggling. To make a long story short, after a few hours and many tears, he prayed to ask Jesus for His forgiveness and to be the leader of his life. I’m not going to mention the man’s name or his struggles, but if you could generically pray for him and his family this week, God knows who it is you’re praying for. I told you this story because again there is nothing else in life like helping people discover Jesus. Yes we had 2 great Experiences and yes I got to be up front doing my thing…but sitting with someone in my office and leading them into a relationship with Christ was by far the highlight of my day! So who are you inviting next week…again we’ll be doing something special as we look at the 1980’s and I’ll be preaching a message based off the song, “Everybody Hurts”.